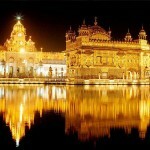 The Golden Temple or Swarnamandir is considered to be the holiest of all the pilgrimages of Sikhism. The Golden Temple is also known as Haramandir meaning Temple of God.In Amritsar Dewali is the most greated festival.The whole city is illuminated with lights.Tourists from all over the world visit the temple and city to enjoy the beauty of the lightening of the fireworks and temple. 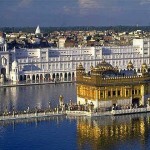 In 1577,the 4th Sikh Guru Ramdas following a request from Emperor Akbar to built this city. The old city encircled with the wall with entrances. The city is now surrounded by circular road instead of wall.In 1573, at the heart of the city a large sarovar or water-reservoir was dug up by Guru Ramdas. From his name the name Chawk Ramdaspur was derived. In 1601,5th Guru Arjan renovated the Sarovar extended the area to make it rectangular and built Harmandir in the middle of sarovar. Guru Arjan invited Muslim Saint Hazrat Mian Mir from Lahore in the foundation laying ceremony. To make it equivalent to Nectar the water of the sarovar was purified. 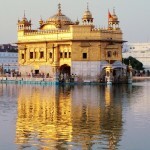 Since then it became the sarovar of Amrita, i.e,Amritsar. The holy scipture of the Sikhs,the hand-written Sree Guru Granth Sahib compiled by 5th Guru Arjan,was placed at Haramandir in 1604.10th Guru Govind Singh, Before his death in 1708, revised Adi Granth Sahib & declared the book as the eternal Guru of the Sikhs. Emperor Jahangir being afraid of the Sikh uprising, ordered imprisonment of Guru Arjan in 1606. In 1629.Har Govind,the son of Arjan, despite three consecutive retreats,defeated the Mughal army of Shahjahan on 4th occasion. From then Amritsar became a holy place for the Sikhs. Ahmed Sha Durani had to retreat on the face of united resistance of the Sikhs In 1757. However, in 1761 Ahmed Shah Durani again invaded and captured Amritsar. Ahmed Sha Durani also destroyed the temple. In 1764 the temple was rebuilt. In 1830,Maharaja Ranjit Singh built todays 3 storeyed Haramanir with marbles.On the entrance of Haramandir, the quotations from holy Granth Sahib are inscribed in Gurmukhi language.It takes 3 and 1/2hours to read at a time. The walls are set with mirrors and all wall are ornamented with gold and colorful flower paintings.On top is a tube like dome,as if it is an inverted lotus,3500verses are inscribed on the dome. Maharaja Ranjit Singh wrapped the dome with 400kg of gold on copper base. The whole interior of the temple is decorated with gold,silver and ivory. Apart from the main entrance, there are also four other entrance of the temple signifying that the doors of the temple are open to four Hindu Sects. 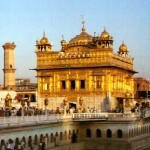 This entry was posted in Golden Temple, Punjab and tagged about golden temple, golden temple history, golden temple images, golden temple in india, golden temple india, golden temple information, golden temple map, golden temple of india, golden temple photo, golden temple photos, golden temple pic, golden temple pics, golden temple picture, golden temple pictures, golden temple tour, golden temple tours, golden temple website, golden temples, gurdwara golden temple, gurudwara golden temple, Haramandir, history of golden temple, images of golden temple, indian golden temple, photo of golden temple, photos of golden temple, pics of golden temple, picture of golden temple, pictures of golden temple, sikh golden temple, Swarnamandir, the golden temple. Bookmark the permalink.